The increased engagement of Robots and Artificial Intelligence in various aspects of modern business challenges the traditional perception we have of employment relationships and will almost inevitably bring considerable changes to the job market. 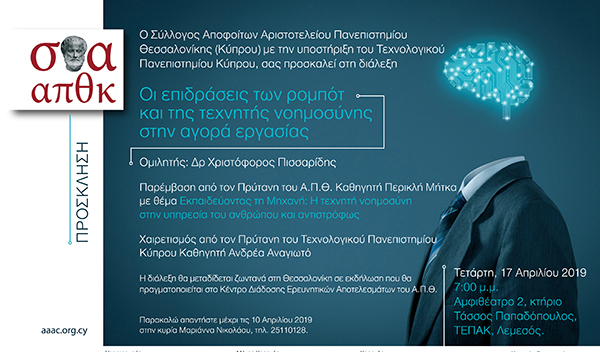 In this context, Elias Neocleous & Co. LLC is proudly sponsoring a lecture organized by the Cyprus Alumni Association of the Aristotle University of Thessaloniki on the impact of Robots and Artificial Intelligence on the labour market. The Keynote speaker, 2010 Nobel Laureate Economics Prize winner Dr Christopher Pissarides will provide valuable insight into all the relevant issues. Moreover, Pericles Mitkas, Dean of Aristotle University of Thessaloniki will deliver a speech on issues of machine learning: Artificial Intelligence in the service of humans and vice versa. The lecture will take place in Limassol at the ‘Tassos Papadopoulos‘ building of the Technical University of Cyprus on Wednesday 17th April 2019 at 19.00. Please contact Ms. Mariana Nikolaou by 10th April, on 25110128, to register your attendance, which is free of charge.